I’m so happy for you to meet our latest Lady Wrap Star, Helen! She is just so awesome! I actually don’t know her personally but after reading what she wrote and sharing in her head covering happiness I want to hop on the next bus to Manhattan and get to meet her! My name is Helen Shere, and I reside in Manhattan with my husband. I’m currently in my first year of a doctoral program in biomedical sciences. My concentration is in cancer biology; I spend half the day in class and the other half in lab, doing research. I began covering my hair full-time the day after I married my best friend. It’s actually kind of funny—I hadn’t planned on covering full-time at all. I wasn’t raised Orthodox (I became a ba’alat teshuvah, a returnee to observant Judaism, in high school), and I always thought to myself, “Well, I went from doing nothing to keeping kosher and keeping Shabbat…I think HaShem (G-D) and I are doing pretty good here. I don’t really need to cover.” But, the first Sheva Bracha after our wedding was in a community in which the norm is for women to cover full-time, and I thought it would be appropriate to cover for that occasion out of respect for our hosts, who had gone to much trouble to make the event. So I bought a dress and a tichel to match it. I remember getting ready to go to the Sheva Bracha and wrapping for the first time. As I wrapped, I remembered how I had heard from married friends that hair covering was a “hard” mitzvah (commandment). I waited for it to become “hard.” Looking back, I’m not sure what I expected to happen. I suppose that I was waiting for the “difficulty” of the mitzvah to suddenly hit me like a ton of bricks, but when I was done wrapping my tichel and looked in the mirror, I only saw myself…as a regal-looking woman who was publicly showing her connection to her husband and to HaShem. I’ve been covering every day since then, and have yet to find it burdensome. I love wearing tichels! I cover with them nearly 100% of the time. I bought a sheitel (wig) after caving to the pressure of questions like, “But what will you wear to weddings?” but I’ve worn it less than 10 times in the eight months I’ve been married (and yes, I’ve worn tichels to weddings and gotten nothing but complements). I love playing with the colors and textures of scarves, and I appreciate the jolt of creativity it gives me in the morning when I pick out that day’s wrap. On a practical note, working in a laboratory means that my hair has to be back in a ponytail or bun; tichels take care of that without looking dowdy. 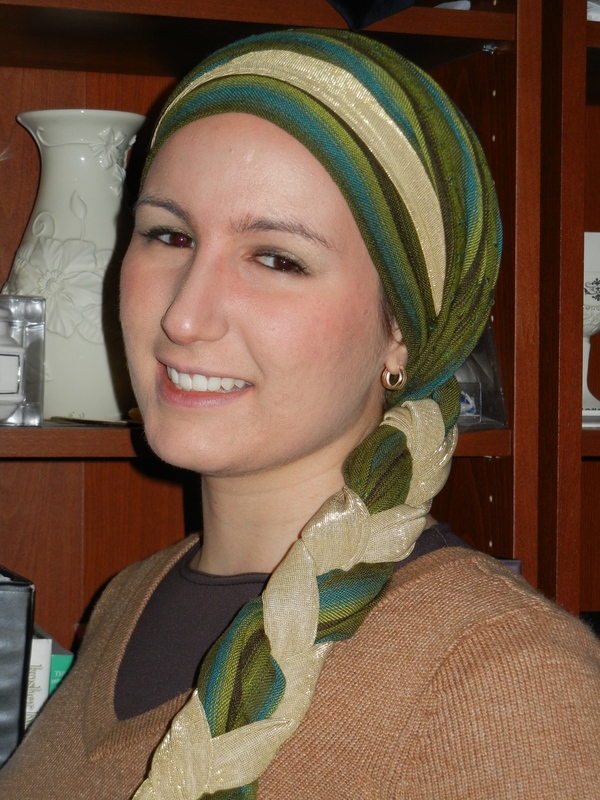 Also, before I was married, wearing my hair up/back was the norm for me, so I’m most comfortable with a head covering that allows me to wear my hair underneath it in a familiar style. I’ve gotten nothing but positive feedback from my class- and lab-mates about my hair covering. I often give impromptu tutorials in the bathroom after class to classmates who are curious about how I wrapped that day’s tichel. Fun fact: I figured out which wrap styles and colors look best on me because one of the cashiers in my school’s cafeteria has made it her unofficial job to point them out to me! She’ll tell me, “That one I like. The one yesterday, not so much. You should wear more pink. ” She’s hilarious! All Photography credit goes to: Rachel A. Minkoff! Oh gorgeous! Love all the tichels you are wearing. Thank you for sharing with us. It is funny how our preset expectations, I mean, how we think we are going to feel or see ourselves can change completely when we face the reality and do something for the first time. I thought covering would be harder as it is not a norm here in my home country. Usually those who cover their hair are either muslims or hippies (a hippie refers more to style here than anything else). But, it has always felt just normal, something natural. Yes, I still tend to overanalyze because I do draw attention and I have never felt comfortable being in focus. Not all those looks I have had have been positive (just because I cover my hair!) and I have had a lecture of “Finnish values” whatever they were for her, for me they strongly include freedom of religion and especially equality of what we are historically famous for. That’s so true, what you said about preset expectations. When I was becoming more religiously observant, I was constantly being surprised because the “big” things turned out to be easier for me than some of the “smaller” things that you’d think would be a no-brainer to pick up. And I hear you about being part of a community. In the community I live in now, the overwhelming majority of women wear wigs to cover their hair and consider tichels to be for lounging around the house only. So I’m definitely my own “picture” by wearing tichels every day. “…. and I have had a lecture of “Finnish values” whatever they were for her…” – I could just imagine the conversation. It is a pitty that some people don’t realize that despite whatever she may have valued as her “Finnish values”, people do get cancer and loose their hair in treatment, people do get Alopecia and loose their hair (or at least some of it) without knowing why or how to reverse the condition, people’s hair do thin for various reasons and regardless of YOUR specific reason for covering, you are indirectly also supporting all of these people who have to battle through their day with feelings of insecurity about having to cover their bold heads. Personally I have about 7 reasons for covering my hair, from the long list of reasons why people cover their hair. However, I don’t feel the necessity to go into all 7 reasons when somebody enquires or talk to me about it, I just simply say that I have many reason for doing so, but that I also have a friend who lost her hair due to cancer + chemo therapy and that I’ve said I will support her by also covering my hair – at least we are 2 in our town who does so and she doesn’t have to feel that she’s the only one. People are immediately quite taken aback when they hear this reason. Maybe her “Finnish values” are to support those in her community who suffers too, but she just haven’t thought of hair covering as a way of supporting one of her values! Maybe she likes to make a difference in the world (and i guess it is true, therefore her need to let you know what she regards as “Finnish values”) – but she hasn’t made the connection that by hair wrapping, she can support a great amount of medical sufferers and make a difference in their world. And if she would have considered taking up hair wrapping, she would probably also have a few reasons for doing so, picked from the long list of possible reasons. I love the comments you make about tichels being practical for labs too! I could not agree with you more! I don’t cover full time or for religious purposes, but if I go back to research, it’ll be with a scarf( or scarves) on my head. Thanks! All your tichels are beautiful Helen – well done! And another reason to add to the already long list for hair wrapping – “Work related – i.e. Lab work, bakery, butchery, nursing” – I never thought of that!